Don’t let anyone crush your dreams. However, the riskier your dream, the better your backup plan must be. That was the first time someone had crushed my professional dream. The teacher may have been right about the 6’10” part, but this molder of young minds lacked the understanding of what negative reinforcement can do to little kids. She also lacked the understanding that height isn’t everything for a basketball player. Teachers, especially in the impressionable K-12 years, are my personal heroes. Yet they need to be dream builders, not dream destroyers. It’s healthy to discuss rational backup career plans, but why spoil youthful exuberance which could flower into the unexpected? 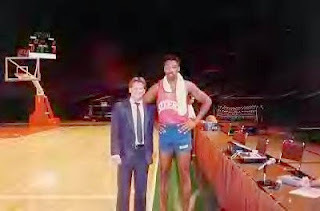 Postscript: When I was 25 years old, I met the great Dr. J and got to play one-on-one with 7’4” center Mark Eaton of the Utah Jazz, that year’s NBA Defensive Player of the Year. I’ll leave the game results to your active imagination. Perry Binder is an attorney, a Clinical Associate Professor of Legal Studies at Georgia State University, and the author of several law articles and books. His seminars and keynotes for companies, law firms, colleges, and organizations are described as "hilarious, enthusiastic, and practical." Perry received the Teaching Excellence Award (2005 & 2013), MBA Crystal Apple Award (2008), and Service Excellence Award (2011), from GSU's Robinson College of Business. Years earlier, he litigated complex business cases in Miami, and received the Dade County Bar Association's Pro Bono Award, for service to individuals unable to afford legal counsel. Perry is a member of The Florida Bar and the Academy of Legal Studies in Business. He is a former radio talk show host who is frequently quoted in the media, including USA Today, The New York Times, and ESPN Classic. Seven years of college down the drain. In 99 Motivators™ for College Success, Perry Binder is one part professor, one part career mentor, and one part classroom cheerleader. His Motivators, insightful stories, and takeaways are presented in bite-sized tips and quotes on college success in class, in career choices, and in life. Perry gives away all of his teaching secrets, including advice on how to study for multiple choice exams and how to write model essay exam answers. This book is dedicated to any person who walks into a college classroom and dares to dream about a better today and tomorrow.